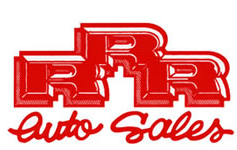 Welcome to RRR Auto Sales. Established in 1987, we are a family owned and operated business. With many vehicles in stock, our inventory changes daily. We specialize in trucks and SUVs. All vehicles are thoroughly inspected and serviced before being sold. All vehicles are warrantied by us, and some still have the manufacturer's warranty. Inventory is hand picked by the owners of RRR, so that we can feel confident that we are gaining a satisfied customer when selling them to you. We have a full Service Department that offers service to all customers at discounted rates. We know our customers by face, name, & vehicle. Check out our inventory or contact us if you're looking for something special. Financing is available with competitive interest rates if you are in our lending area and qualify. NO DOC FEES ever at RRR! TIRED OF BEING RIPPED OFF SERVICING YOUR VEHICLE? Try our service... honest people charging honest prices! We have 4 bays/lifts to service your automotive needs. We are also a MA State Inspection Facility. Listed below are a few everyday service specials we offer. Our prices are far lower than our competitors. Free estimates also performed. From minor to major repairs, we promise quality service at discounted prices. Check engine lights, ABS lights, Airbag lights, and all other diagnostics available as well. *Most vehicles. This is NOT a gimmick. BUT if you have a Volvo, BMW, or Mercedes, these prices will be slightly higher. CALL for exact quotes. We promise you will save on service with RRR. TIRED OF ANNOYING "MAINTENANCE REQUIRED" LIGHT? "CHECK ENGINE" LIGHT? "ABS" or "AIRBAG" LIGHT? We have the knowledge and technology to perform your dealer "maintenance required" services at a discounted rate. We can also diagnose your "check engine" light, "ABS" or "Airbag" light. Most dealers charge over a hundred dollars just to hook up to a diagnostic machine. At RRR, we try our best to give quality service at a discounted rate.